The last time I sat down to write a column, I still had one parent left. Now I don't. I'm still not quite sure how I feel about that. It's not grief. I'm not sure what it is. How can you grieve when someone's suffering ends? Following a cerebral aneurysm in 1977, my father, Dr. Henry Lo Guercio, was left brain damaged and paralyzed on one side; hopelessly disabled. 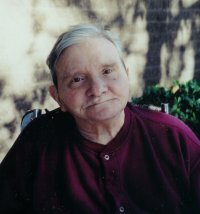 In the years that followed, he had happy moments, like when he'd come for a home visit or when I'd push him around in his wheelchair at the Yolo County Fair, but not a day went by in all those years that wasn't permeated with boredom, frustration and depression. The main things my father was aware of were that he wanted another cigarette and he wished to be with me 24 hours a day, seven days a week, 365 days a year. Cigarettes were a fairly easy wish to grant. The other was an impossibility. In the back of my mind, I was constantly aware that my dad was sitting alone at the convalescent hospital, wishing I'd walk through the door. Every moment I wasn't there, I was breaking his heart. Which weighed heavy on mine. When I'd visit him, he'd cry out in relief as if he hadn't seen me in years, whether I'd been there a week ago or five minutes ago. When it was time to leave, his despair was evident. I was abandoning him all over again. I've taken care of my dad since my mother died in 1986. You'd think in all that time, going to the convalescent hospital would get easier. It didn't. If anything, every visit was a bit more difficult than the last. I felt like I was holding a knife at my own back to keep my feet moving forward, propelling me through the front door. I hate the convalescent hospital more than any place on earth. Hate, hate, hate it. The odor of urine and feces, the groans and wails of misery, and the sad, empty eyes on the faces of those lining the stark hallways still haunt me. Don't misunderstand -- my father's hospital was a very good one. It wasn't the most modern, but it was clean and the care was good. But a convalescent hospital is intrinsically grim. It's a warehouse for the dying, the last stop before the final stop. All the more reason why it's important to visit people who live in one. It means everything to them. Over the years, only a handful of people besides myself visited my father. Many people told me they couldn't bring themselves to visit because they wanted to remember my father as he was before the stroke: brilliant, articulate, passionate. To see him crippled and miserable was too painful. I'd fight the urge to snap, "It's a lot less painful to see it than to live it." But I'd hold my tongue and tell myself that everyone's only doing the best they can. I have a picture of my dad, taken only weeks ago on his 80th birthday. He mustered a smile for me that faded only moments later, and sagged back down in his wheelchair, staring into nowhere, lost in his own internal world. What went on in that internal world, I'll never know. But I'm certain it wasn't blue skies and sunshine. How do you grieve over the ending of this relentless unhappiness? If anything, I grieve the last 26 years of his life, not its end. My father officially passed away on Dec. 27. But he really died in 1977. It just took him 26 years to draw his last breath. I think he hung on just to spend a little more time with me, to watch out for me, no matter how painful it was. He watches out for me still, from a distance. I'm thankful it doesn't hurt anymore. If there can be anything good to come out of losing a loved one, it's a renewed appreciation for the friends and loved ones who are still here; to focus on what's left rather than what's lost. It's also a reminder that each day you spend on this earth in good health, with an intact body and mind, is a precious, precious gift. Never take your health for granted. As I said in my dad's eulogy, life is a rose garden. It's about the flowers, not the thorns. And I'm so thankful for everyone who still blooms in my garden.